THE PREACHER – Ted Thackrey, Jr. This is another book that is in my Kindle and I have absolutely no idea where it came from. None of the usual places where I get my Advanced Reader Copies of books has this title. I suspect it came straight from the publisher, but I just have no memory of downloading it or sending it to my Kindle. Ah well…I’m just glad to have gotten a chance to read and review this book. The Preacher is part western, part mystery/thriller – all of which blends into a pretty good mix when done well. The Preacher is a former priest, former Special Forces soldier and now a full-time gambler – gambling for more than just money, but for justice as well. The opening chapter really had me hooked, but I would have to admit to having a weakness for a well-written description of a good poker game. (It doesn’t come up too often, but it does happen now and then.) It sets the tone well for The Preacher’s coolness and his strength. One thing that was just a little awkward was that I did not feel I got enough background information on The Preacher to really understand why he was doing what he was or how he had become the person that he now was (did I miss something?). I see that there are more books in the series (though the author has passed away) and perhaps we get more of his personal story as the series goes? All in all, The Preacher is a form of modern western superhero which is a very different sort of genre mashup – one you don’t typically encounter. And under the pen of Ted Thackrey, Jr. … it works. Looking for a good book? 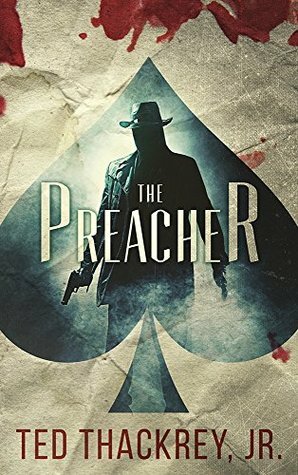 The Preacher is an exciting western/thriller read by Ted Thackrey, Jr. that should be enjoyed by anyone willing to test the waters of this genre blend. I likely received a free digital copy of this book, though I wouldn’t swear to it as I don’t remember when, where, or how.